Rigidity and inflexibility flies in the face of industry. To innovate, we have to bend. To create, we have to flex. It’s new ideas, new ways of thinking and the ability to adjust to circumstances that brings success. When we fail to think on our feet or find creative solutions to difficult problems, then we fail to find success as well. Philosophically, flexibility works on multiple levels. Practically speaking, flexibility also works. Intermediate Bulk Containers marry the philosophical ideas of flexible solutions with the practicality of actually providing those solutions to businesses. The Intermediate Bulk Container — known in the container industry as an IBC — is a simple solution to complex container problems. 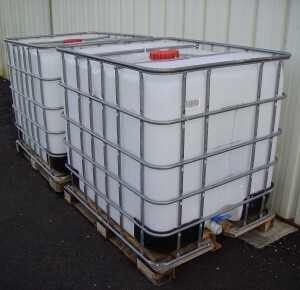 IBC Tanks come in a wide variety of materials, grades and sizes. They transport everything from hazardous waste to powders to pet food. You can outfit the IBC Tanks with various valves, stands and accessories to make them work for your purpose. And you can even clean them out and use them again. In short, an IBC Tank can just about do it all. IBC Tanks provide ideal flexible solutions because of the sheer range of options you can choose from depending on your needs. Sometimes, you require a heavy-duty tank to do some heavy-duty for your product. The asset style IBC Tank was designed for long-term use and reuse for a variety of products including liquids, powders and granular materials. These tanks are made from more durable materials like stainless steel, carbon steel, or a heavy, moulded plastic. The moulded plastic tanks fit inside a cage. Heavy-duty tanks range in size from 900 to 1,350 litres. While heavy-duty tanks last longer, you don’t always need the heft or cost that comes with those tanks. A lightweight tank is generally made from plastic and still fits inside a cage. They pack flat for easier return. Additionally, using liners in these tanks eliminates the need to clean the containers between uses so the turn around to reuse the container shrinks drastically. The uses for all the varieties of IBC Tanks are endless. FDA and Health Canada approved tanks can carry food and other consumables. UN-rated tanks can hold dangerous goods. Non-rated tanks can carry other non-dangerous and unregulated goods like pet food, oils, water based paints, or grain. You can easily reuse the containers as well. A thorough, specific cleaning or a reconditioning of the tank means your IBC Tank could carry pharmaceuticals one week and lubricants the next. By reusing IBC Tanks, you also do your part to protect the environment by keeping other kinds of containers out of landfills. And, you reduce your container costs because you don’t have to buy new containers each time you need to transport something different. Thank you for the feedback Edilberto.